Spring slid into summer slowly this year. It was just early May and I was harvesting violet blossoms and then it was just late May and I was picking Nettle and Cleavers while the petals from the wild plum and the wild apples fell to the ground like snowflakes dipped in perfume and it seemed as though summer stretched out before me forever. Then one day I blinked and looked around and realized it’s nearly two-thirds past, this brief season of summer in the northern latitudes. Midwifery has kept me quite occupied of late. The world brims with possible ways to spend one’s time, things to work on, things to explore, things to do. And there’s me, with just twenty-four hours in a day. As a midwife and herbalist, mother and wife, driver of the car, keeper of the house, buyer of groceries, washer of clothes, mopper of the floor every moment is a choice about how to spend my time. 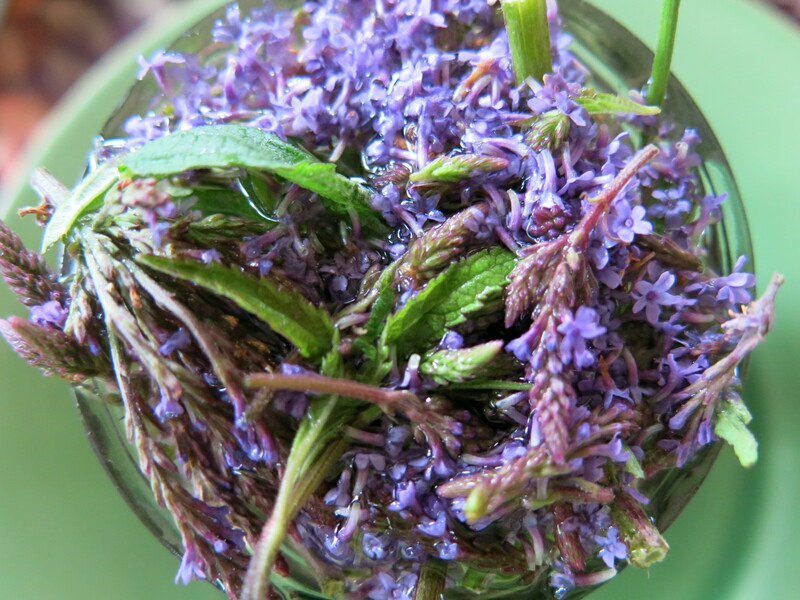 I love the mamas and the babies but sometimes I grieve the time I used to have to bumble about as an herbalist. I’m not talking about the time spent in consultation with clients or the time spent teaching or updating my website or financial spreadsheets; those tasks still get done. I’m talking about the empty time where I could drive around and find a new semi-wild space in the urban or suburban landscape to explore, or work lazily in my garden a little bit each afternoon, or the long mornings spent on my in-laws farm making lots of medicine, taking a walk, stopping to eat some berries, seeing what I can find. These days I am often desperately hoping for a dry day that corresponds with some free time and the right harvestable moment in a specie’s lifecycle where I c an cross something off my list, something that MUST be harvested now or I won’t have the medicine for the year to come. I don’t want my plant gathering to be driven by an intense acquisitiveness, I just want easy low-stakes openess to whatever comes along. In this season of abundant sunshine and abundant plant life and abundant possibilities I suffer from a scarcity of time. To do one thing is to choose not to do another. Things are just different now. My children are getting older. My daughter has a job and a busy social life. My son has friends and baseball practices and games. Gone are the days when I ran the show and they just came along with me when I meandered through the fields, visited far-flung regional parks looking for new places to see plants or stopped the car on the side of the road to harvest some elderberries glimpsed through the car windows. Those were special days. But now my kids aren’t along for my ride anymore, instead I am here to help them facilitate parts of their own lives until they are ready to do those parts on their own. And these are special days too in a different way. I think I have been handling it as gracefully as I can. I have a bit of tantrum once in awhile, to be sure. There’s some challenge in my life now, mainly from the constraints placed on my life by the very choices I have made and the occupations I pursue. I try to remember that. I chose this. I chose it all. There’s bittersweetness too, knowing things will change and there’s sweetness as well. Spending a sunny morning picking strawberries with my son is a bit of sweetness indeed. This is my season of life right now…abundant possibilities, scarce time. I know more time will return to my life. And because the grass is always greener, when those days come around I will probably ache for what has passed. That time in the fields and forests has to be planned for now. It has to be carved out of the busy week. And carve it out I do when I can Summer give off a steady, thrumming beat. The days are long. They feel slow and a bit languid but the hours and hours of daylight lend endurance. These are the days where a person can go the distance. July is the time of blossoming. Driving down the highway with the windows rolled down I can smell that vanilla and hay scent of the Sweet Melilot. Chamomile, Elderblossom, Blue Vervain, Sweet Leaf…July is the time to harvest the flowering plants. The shelf is full of jars waiting to be decanted. Still, the list remains long. Sometimes I despair when I look at it. I missed the brief bloom of Linden. I knew they were blooming. I just couldn’t find the time. I take heart in knowing my herbalist friends will help me when my apothecary bottles are empty. 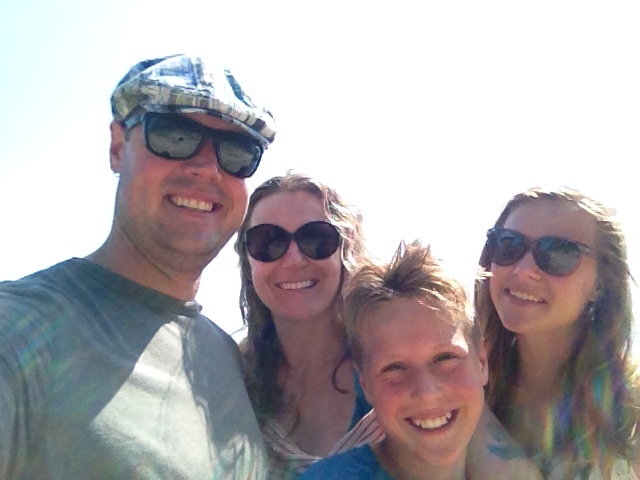 In this season of abundant daylight I want to share with you a few of my favorite things this summer. Perhaps if you have little bit of extra time, effort, motivation, money, you may find something on my list you want to inspire you. 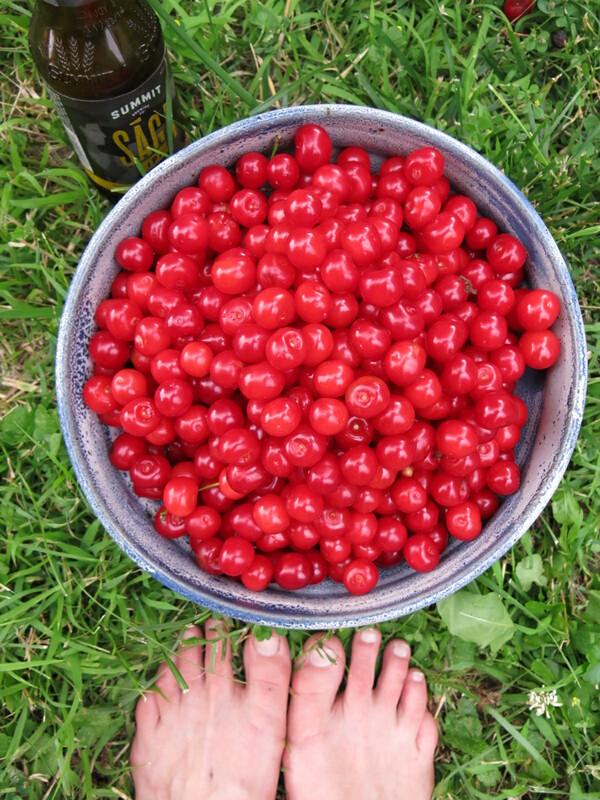 Standing on a footstool, barefoot, picking the semi-sour cherries of my little cherry tree and sipping on a local beer was a lovely way to spend a spare July hour in the evening. 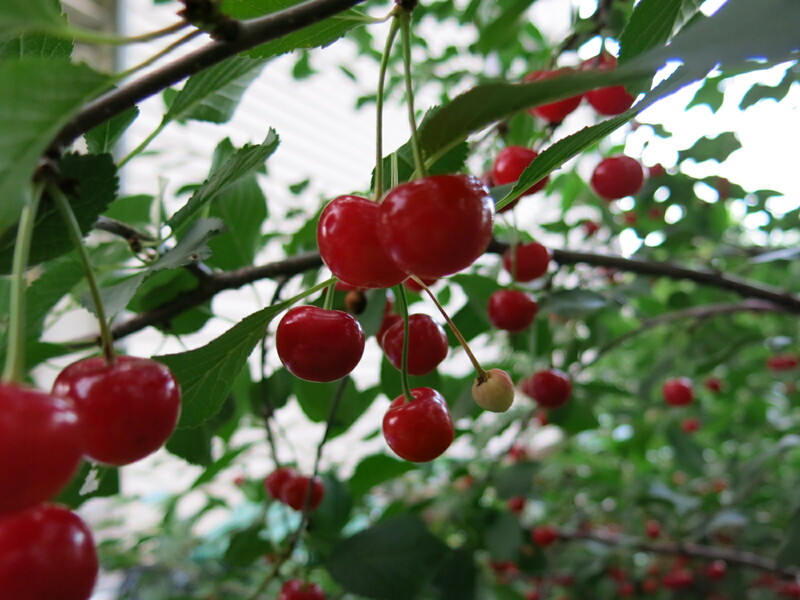 I highly recommend growing a cherry tree. They bloom beautifully in the late spring and are and low maintenance. You have to be aware to beat the birds to the cherries or you won’t have any. Making jam with cherries and hot peppers is my favorite. My recipe is below. No need for pectin, just cook it until it’s nice and thick. Cook the cherries, sugar, vinegar and peppers until it’s your desired thickness and the flavors are well developed and harmonious. Use an immersion blender if desired for a few seconds to chop the cherries up a bit and make the overall mixture thicker. Process in sterilized jars, with 1/4 inch head space for 10 minutes in a hot water bath canner. This jam is sweet and sour and a little hot and deliciously cherry flavored. It’s wonderful with goat cheese on a baguette. Maybe someday I will write a book review of this fine book but for now I’ll just say, take my word for it. 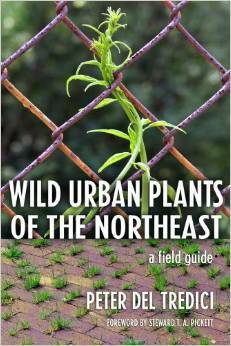 This is a great plant book for anyone who lives in a town or city. You may want to check it out! 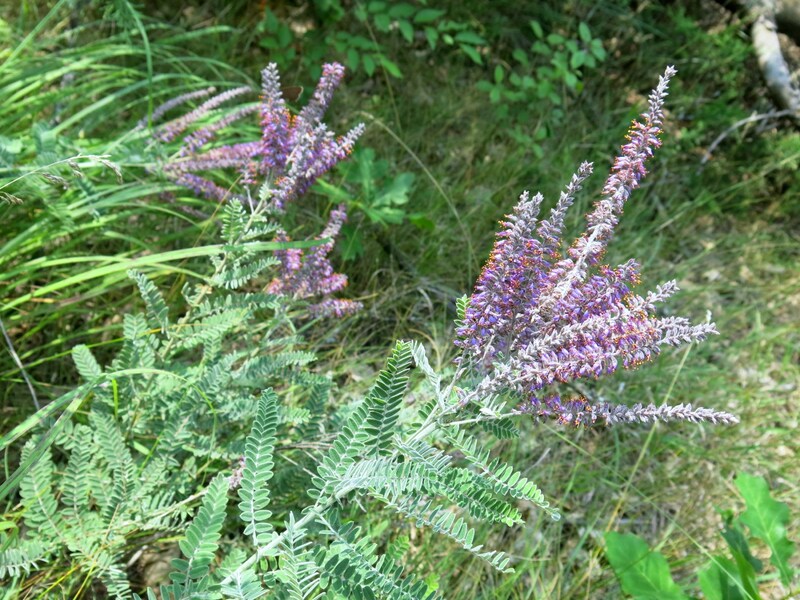 I have also recently loved this article on Pedicularis by herbalist, 7song. 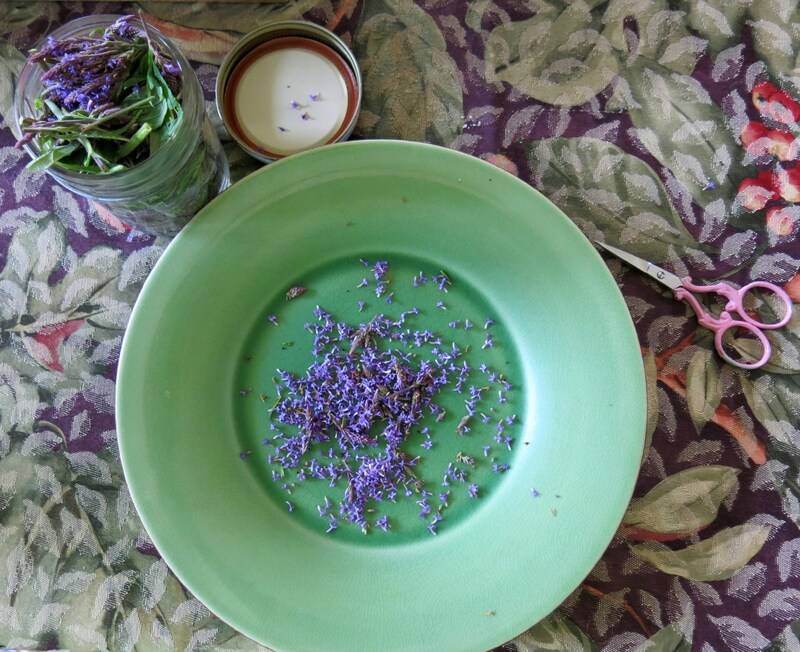 This summer I find these wonderful blogs very inspiring: Rebecca Altman’s Cauldrons & Crockpots, Deer Nation Herbs by Iowa herbalist, Adrian White, who recently wrote a great article called “Sweet and Sour Libations: The Craft of Herbal Oxymels”. 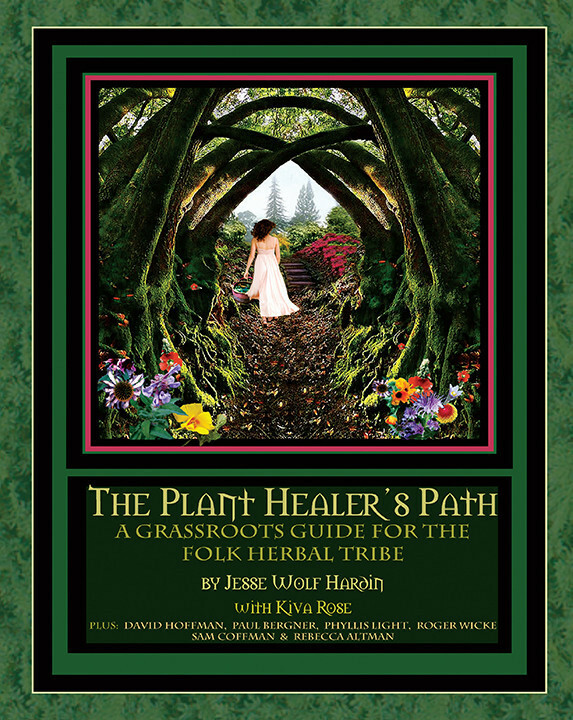 Another recent addition to the herbal bookshelf is the Plant Healer’s Path by Jesse Wolf Hardin and Kiva Rose. It’s full of inspiring questions about our purpose, place, mission and ethics as herbalists as well as practical information about lovely plants like Rose and Sage and Rosemary. I’ve been eyeing herbalist Asia Suler’s seasonal remedies from One Willow Apothecary for awhile. Every time I go to order one they are sold out. I missed out on the spring remedy, Fresh Sap, and the Valentine’s Day remedy, Be Loved. I got lucky this summer I happened to check out the blog when the summer remedy, Easy Livin’ was available. It’s made with Black Birch and Pedicularis (hence my interest in reading about), Kava, essences of strawberry, hibiscus, kyanite, strawberry syrup and champagne. Yes, it has strawberry syrup and champagne in it! I’ll bet you never thought of that. I didn’t, but it sure makes me think of all the possibilities for future creative medicine making. This remedy has helped me feel that the world is a bit more abundant than I had been thinking. The description makes you think it might be a good remedy for leisure, but in my life it’s actually helped me be more productive largely by feeling less negative about the demands on my time. I feel like I can indeed do most of what I want to do! 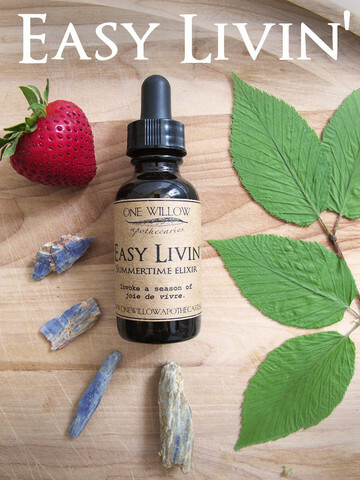 I can’t wait to try more One Willow Apothecary Remedies in the future. Sazerac with organic Star Anise and Lavender essential oils, naturally colored with clays and swirled with care by me. 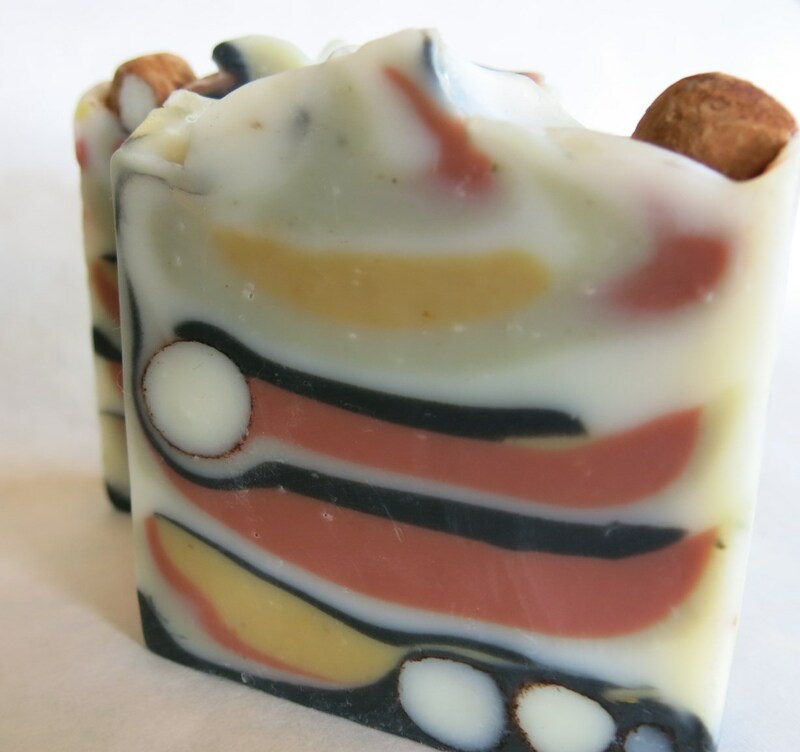 I am pretty darn pleased with this soap! I hope to have an etsy listing up soon, but in the meantime it’s available for 4 bucks from me. Just shoot me an email or any other way you get in touch with me. Hair braided at our geneabirth community blessingway. 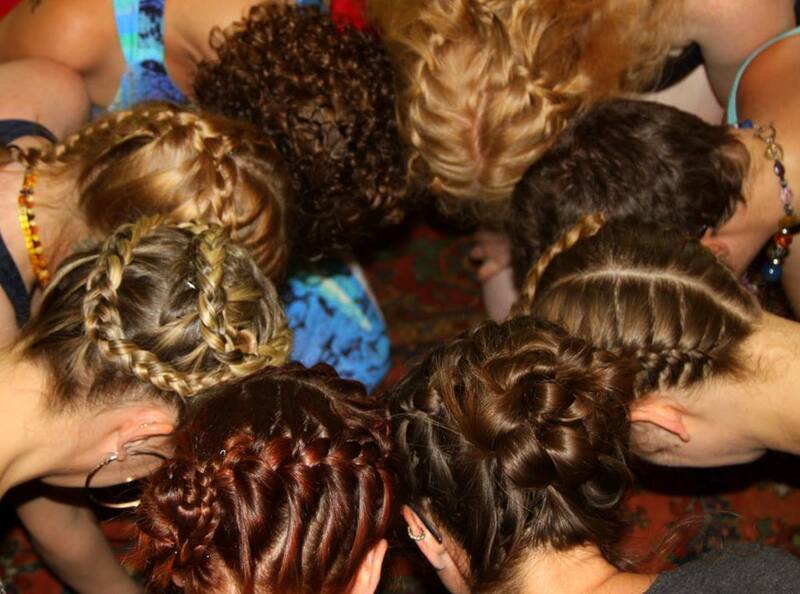 We came together to celebrate the new mama’s with singing, food, words of wisdom and blessing and pamepering which took the form of fancy braids, foot baths and henna. If you missed our July Blessingway, you can get in on the loveliness in January, when we do it again. Lead Plant It’s not often I just stumble across the native prairie plant, Lead Plant, outside of an intentionally restored or managed prairie, but here it is. 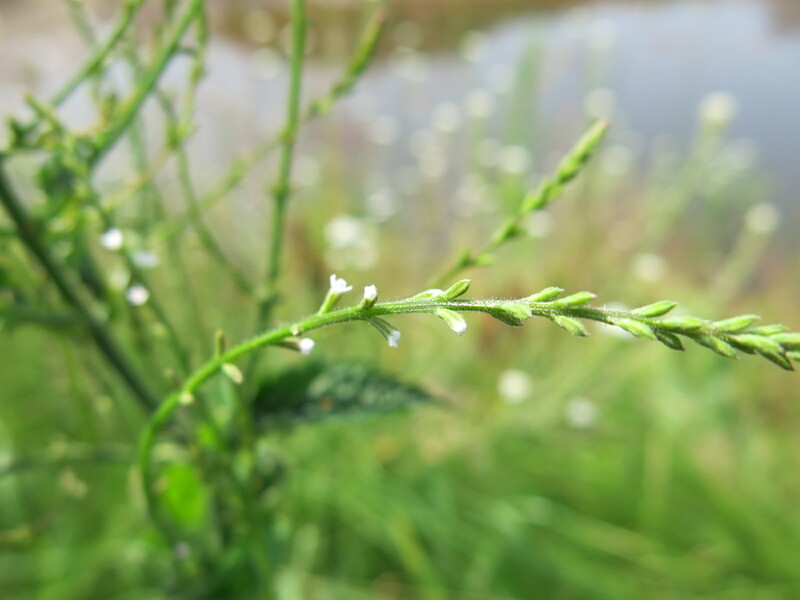 Verbena officinalis has white flowers and they are very fine and slender. 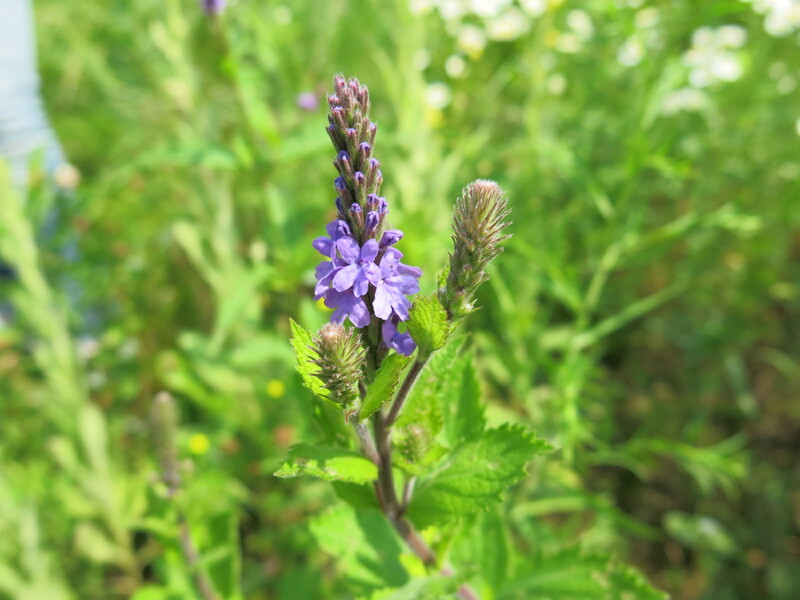 V. hastata, also known as Blue Vervain is one of my favorite local medicines. I use it as a wonderful and transformative nervine for Type A/high strung/overachieving people who experience tension, stress, headaches. It is also a strong antispasmodic for menstrual cramps especially those that radiate down the legs or involve cramping in the bowel and the cramping and alternating symptoms of IBD/IBS. And finally, if that’s not enough, it’s also a great hormone balancing herb that when indicated, is used for PMS and other hormonal imbalances like PCOS. V. hastata likes it’s feet wet. 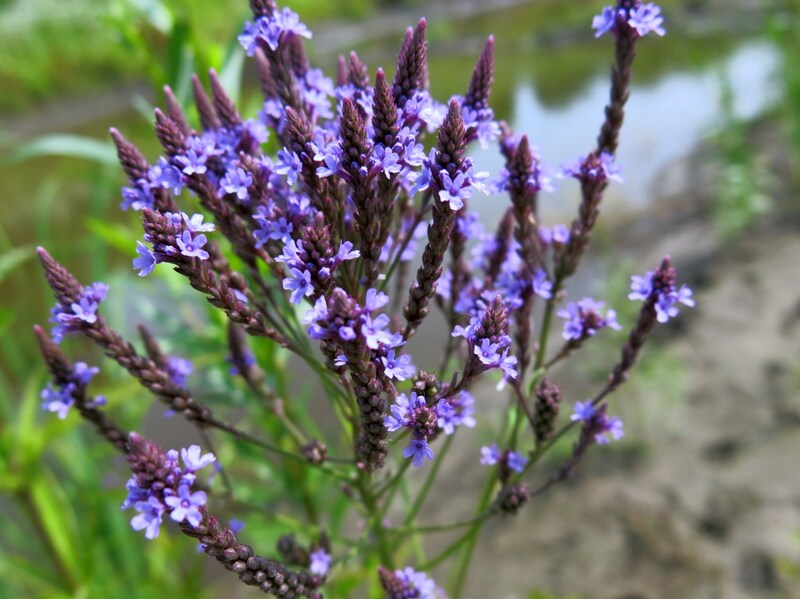 V. stricta, or Hoary Vervain, is the shorter huskier cousin of V. hastata. It tolerates dry sites very well and full sun. Some people use it interchangeably with V. hastata. Fresh out of the ocean with our hair still wet. 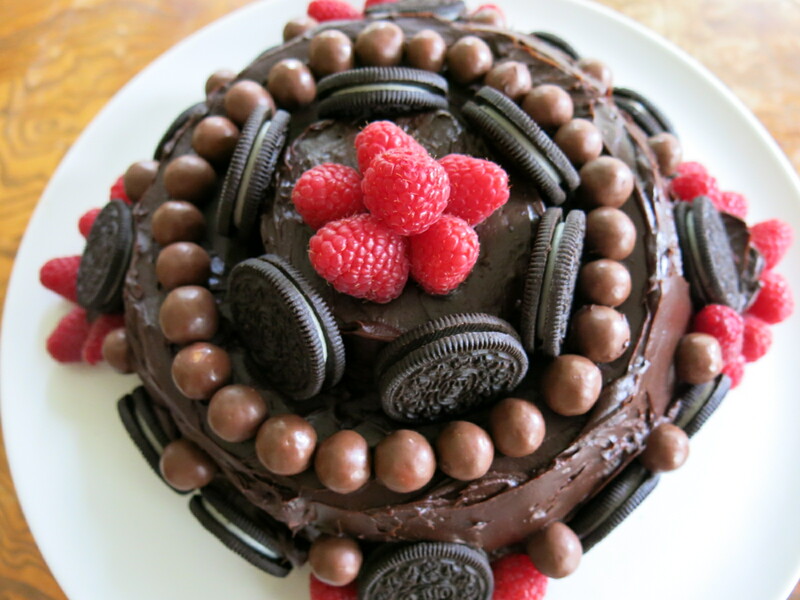 And my summertime baby’s birthday cake. Happy Summer everybody!